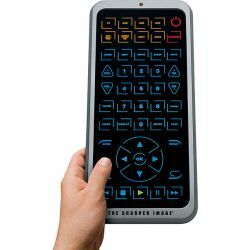 With this Jumbo Universal Remote by Sharper Image, control up to 8 different devices and never lose your remote! 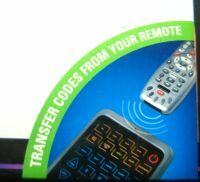 This premium design has many advantages over the other common jumbo remotes with its lighted control pad and learning function to copy the remote signals from directly from your original remotes. Controls 8 different audio or video devices. No more remote clutter! Lighted control panel lights up and illuminates all the buttons when touched. New "Learn" button allows you to program each of the 49 buttons on the remote. It's possible to combine two or more remotes into one setup this way. i.e. You could program the AUX1 setup to control your TV normally with the channel buttons and program the DVD buttons to control the dvd player without having to push the "DVD" button first to go to dvd mode. Compatible with most major brands of TVs. Manual includes a list of remote codes or use the code search feature to program the remote without the codes. Auto shutoff of your TV with the sleep timer. Jumbo size is easy to see and hard to lose.